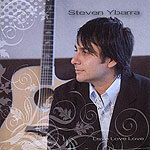 CD reviews: "Sunken Eyes" and "Love Love Love"
These reviews first appeared in Turbula in February 2008. While the 2008 San Diego Music Awards won't be announced until the fall, and voting won't even begin until the eligibility period ends June 30 (the SDMA calendar runs from July-June), two albums that ought to be on every local critics' short list are being released this week: Transfer's new EP, "Sunken Eyes," and Steven Ybarra's "Love Love Love." Transfer's third release finds the band at an absolute peak of creativity. There may be bands in San Diego that have a more polished sound. There may be bands that are more technically proficient. And perhaps even some bands that writer better songs. But it's hard to imagine  and your loyal correspondent has yet to encounter  any local bands that combine all three elements any better than Transfer does on their new EP. With strong echoes of the Beatles and Pink Floyd, there are only five tracks on the new album, but the songs are so well-constructed, so creatively and imaginatively arranged that each is about as close to perfection as music can be. There's definitely a '60s and '70s kind of spirit about the album, even though the members are all in their 20s and also display punk and alt rock influences throughout. But from the effects boxes the guitars are run through to the thick-pile vocal harmonies to lead singer Matt Molarius' anguished wails on "Bitter Pill" that recall late-Beatles era John Lennon, this is an album infused with early mainstream rock. Yet, they pull it off so well that it never seems homage or, worse, ripoff. It's wholly their own  this isn't a comeback by some middle-aged rockers looking to reclaim their youth, but an organic, breathing bit of classic rock by a bunch of young'ns who are filtering what came before through their own experiences, imprinting it with all that's come since the 1960s opened up the possibilities of melding the still-new rock 'n' roll sounds with classical, folk and jazz, and then trying a bunch of new stuff as well. It's a heady listen, and certain to be one of the best albums to come out of San Diego in 2008. Having worked with a full band, Ybarra brings to his debut a real comfort with overdubbing of harmony vocals, of adding strings to the mix, while not letting any of this distract from the simplicity of his arrangements, the purity of the melodies he's written on the 11 songs here. None of the songs is more beautiful than the stunningly gorgeous "Please Please." And yet, he improves on the beauty of the notes by wrapping them in an arrangement that gives the song a wonderful narrative flow, using strings to help build the tension toward the chorus. It is a most impressive bit of songcraft and arrangement. While Ybarra is an openly committed Christian, and the acknowledgements reflect this, the music itself is fairly secular. Some of the songs address issues of faith, the love songs to his wife are more numerous. Short story: This is music for listening to, not an album of praise music. It is, in its own way, as complete a musical vision as that found on Transfer's new album.